DAY 5 OF THE PARTY FOR NO REASON AT ALL. On the last day of the Party, the Dwarves knew they had a lot of work to do. They were keen to do the heavy lifting and the cleaning up when the Party began but after the Feast and the Concert, they didn’t feel their best. Dwarves drink strange drinks at parties and the thumping and banging of their music shakes the drinks around in their tummies. Some of them wished they never had to wake up again but they did wake up. A dwarf is a dwarf is a dwarf. A dwarf’s promise is as solid as ROCK. The Dwarves had promised to be first up and first to start cleaning and that’s just what they did. After a little while, they started feeling pretty cheery again. They never do like sunlight very much so they stayed in the darkest places they could find, had a little breakfast and something to drink. I think that they were drinking some of Mickey’s BLUE WATER but I can’t be sure. All I know is that they started working and they started singing and Day 5 had begun. Endings are just as important as beginnings. The Dwarves started in on the kitchen. Not the Dragon Pits but the ordinary kitchen in Poppy’s Place. It was nice and cool and dark in there. They began to scrub and rub and chuck out the rubbish near the front door. 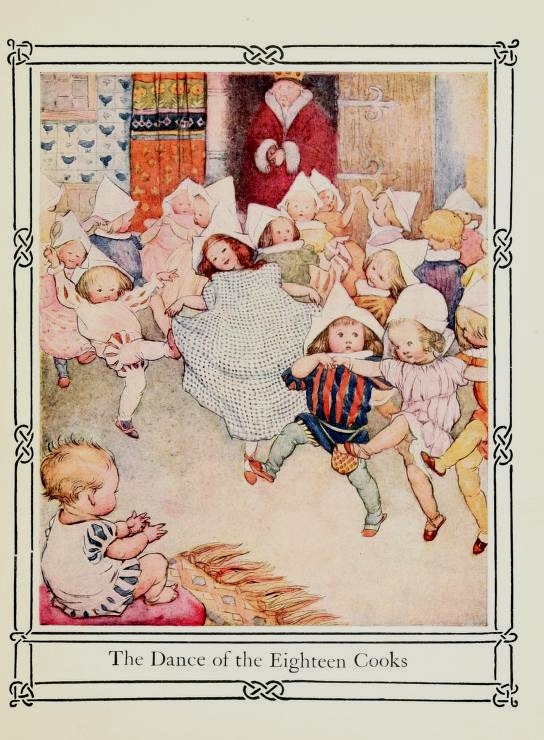 Then they heard some laughing and some singing and the sound of feet on stone floors. Mickey’s water can make even a Dwarf see things which aren’t there but when they turned around and saw eighteen tiny cooks dancing, they were more than a little bit shocked. 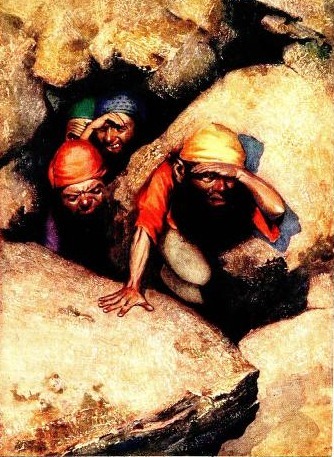 The Dwarves were all ready to go back to Stone Mountain and sleep it off when Andrew spotted one little cook with bright red hair. SAFFRON !!!!! What are you doing ? Who are all these children and why are you in the kitchen? I wonder what they have been up to. We will find out later. For now, there is work to do. If you know what the 18 little cooks were doing, please leave a note here.